Definition: Cleft lip and cleft palate occur when there is a split or opening in the lip and when the roof of the mouth does not close properly during a baby’s early development inside the womb. Together, these birth defects commonly are called “orofacial clefts”. These disorders can result in feeding problems, speech problems, hearing problems, and frequent ear infections. Less than half the time the condition is associated with other disorders. Cleft lip and palate occurs in about 1 to 2 per 1000 births in the developed world. CL is about twice as common in males as females, while CP without CL is more common in females. 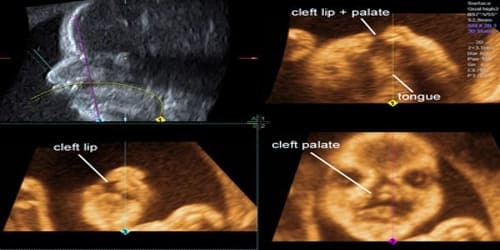 Diagnosis and Treatment: Orofacial clefts, especially cleft lip with or without cleft palate, can be diagnosed during pregnancy by a routine ultrasound. They can also be diagnosed after the baby is born, especially cleft palate. However, sometimes certain types of cleft palate (for example, submucous cleft palate and bifid uvula) might not be diagnosed until later in life. Clefts can also affect other parts of the face, such as the eyes, ears, nose, cheeks, and forehead. If the doctor discovers that the baby has a cleft palate or lip while in the womb, they may want to remove some of the amniotic fluid that surrounds the baby to have it tested for other genetic abnormalities, such as van der Woude syndrome. 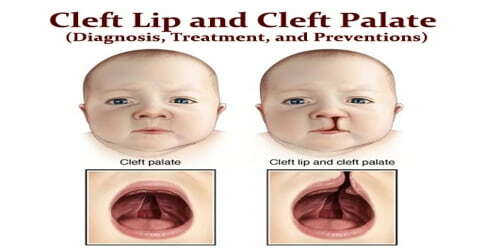 Cleft lip and palate is very treatable; however, the kind of treatment depends on the type and severity of the cleft. The goals of treatment for cleft lip and cleft palate are to improve the child’s ability to eat, speak and hear normally and to achieve a normal facial appearance. Treatment involves surgery to repair the defect and therapies to improve any related conditions. Surgery – Surgery to repair a cleft palate or lip is ideally performed in people’s child’s first year. However, additional reconstructive surgeries may be required well into their child’s teenage years. 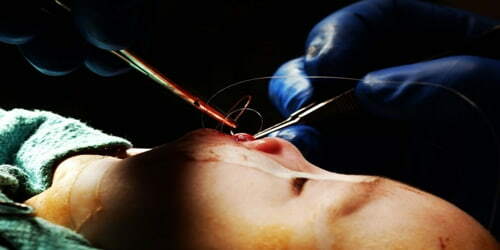 Several different surgical techniques and procedures are used to repair cleft lip and palate, reconstruct the affected areas, and prevent or treat related complications. Surgical repair can improve the look and appearance of a child’s face and might also improve breathing, hearing, and speech and language development. Children born with orofacial clefts might need other types of treatments and services, such as special dental or orthodontic care or speech therapy. Some children with orofacial clefts may have issues with self-esteem if they are concerned with visible differences between themselves and other children. Parent-to-parent support groups can prove to be useful for families of babies with birth defects of the head and face, such as orofacial clefts.